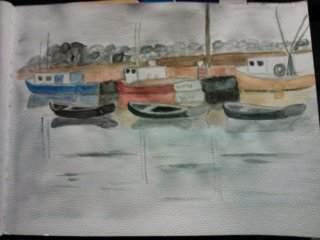 This watercolor painting shows some of the fishing boats I enjoyed seeing in Nova Scotia. I thought the smaller boats were used to go from the wharf out to the fishing boats, but Jo-Anne Harris told me they were pulled behind the fishing boats and were used to carry the big tuna. I was painting this picture tonight and completely lost track of time - suddenly I heard a loud knocking on my back door. My "phone pal" who calls me every night to let me know she's okay had been trying to reach me by phone and couldn't reach me - so she drove all the way down from Hamburg to see if I was okay. I guess I was too involved in Nova Scotia to hear the phone ring.